We are raising money towards the cost of installing and equipping a new Cat Pen. Gosport Cats Protection is manned totally by cat-loving volunteers who give up their time, skills and even a patch of their garden to help look after the cats in our care while awaiting adoption. 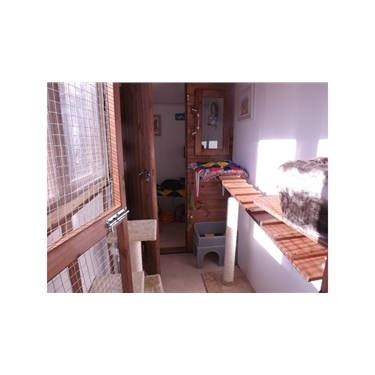 The number of cats we can help is limited only by the number of fosterers and pens we have, so we are keen to raise funds for a new Cat Pen to be built in the garden of volunteer, Jackie. Jackie will be settling each cat in and making sure all their needs are met whilst in her care and ensuring they are ready to meet potential adopters and move on to their forever homes. As one cat leaves, the Pen will get a thorough clean before the next cat on our long waiting list quickly moves in. Our fundraising is not only for the materials and building of the Pen but also for all the things which go to make it clean, homely and welcoming. That’s everything from mops and cloths, food bowls and litter trays through to heating, bedding, hiding places, scratch posts and lots of stimulating toys. And, of course, a chair for Jackie who will be spending very many hours inside the Pen making friends, playing and caring for the cats every day. We’ll keep you updated with pictures of the build and will share with you when the first cat is able to move in to the Pen which YOU helped to provide.